Fun Sketch Challenge This Week! Join our fun sketch challenge this week, with the Paper Craft Crew! There’s lots of room in this sketch to stretch your creativity! 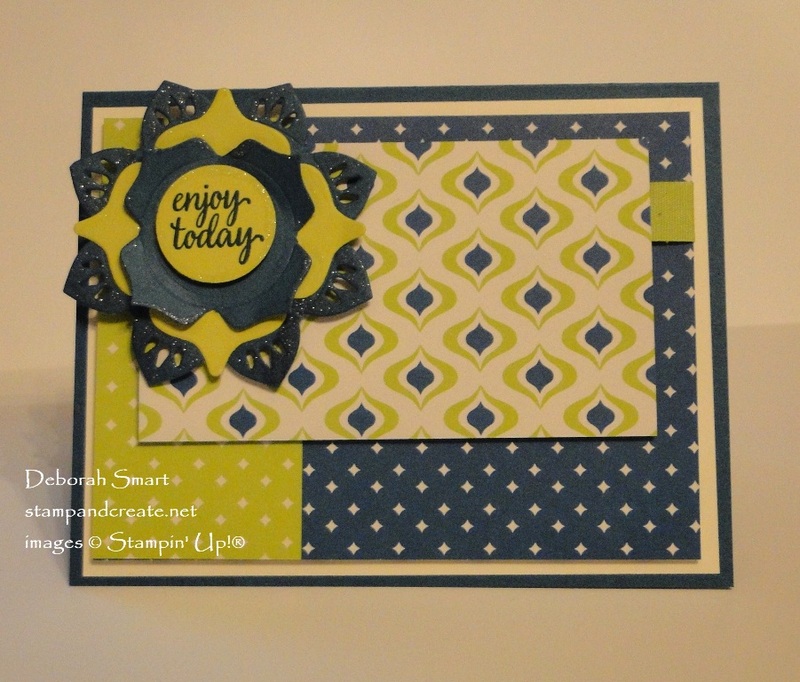 The focal shape in the corner made me decide right away to use the Eastern Beauty Bundle for my card. Using the Eastern Palace Suite of products helped this card come together quite quickly! Another plus is that you can purchase the Bundle of stamp set and dies together, and SAVE 10%. 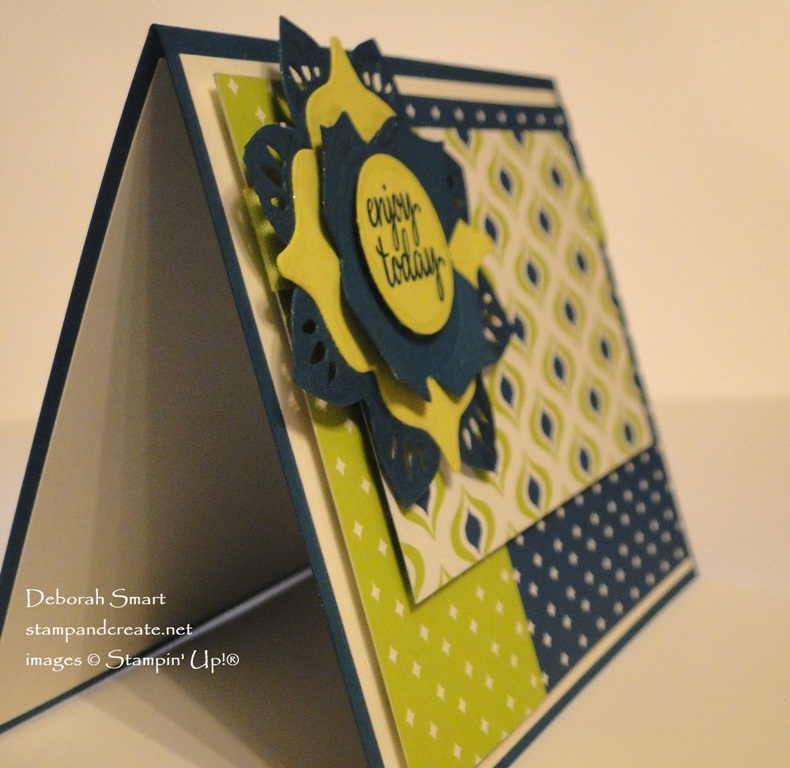 First, create a card base of Dapper Denim cardstock, then layer a panel of Very Vanilla cardstock on top. The next layer is the Eastern Palace Specialty Designer Series Paper denim/vanilla pattern, followed by a strip of the same pattern, but in Lemon Lime Twist, on the left side. Once you’ve layered your 2 pieces, attach a length of 1/2″ Finely Woven Ribbon in Lemon Lime Twist across the top. Now, add the next pattern of DSP on top of the the other panel, and ribbon. Next, you’re ready to die cut your medallion pieces. 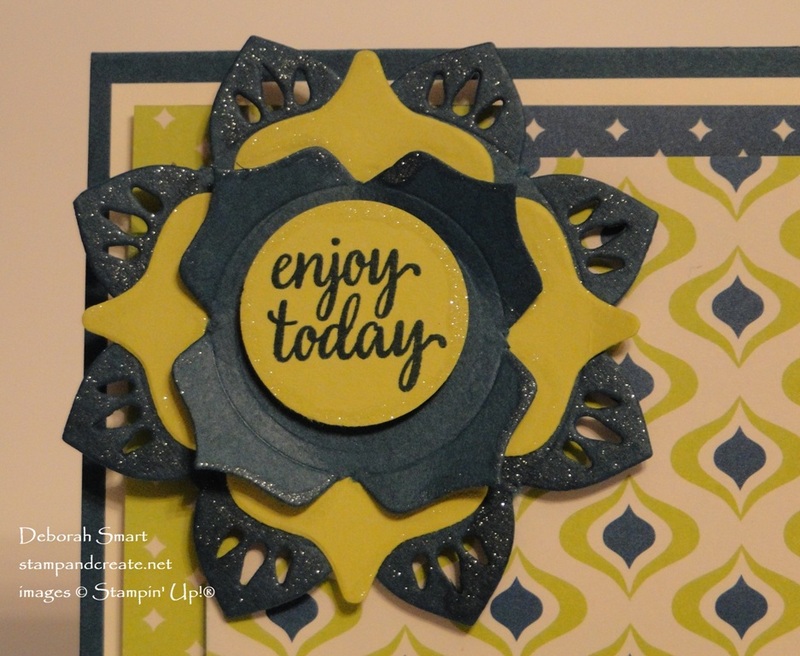 Use Dapper Denim and Lemon Lime cardstock with the Eastern Medallion Thinlits and Big Shot to die cut the different shapes, and layer them together with Multipurpose Liquid Glue. Stamp the sentiment from the Eastern Beauty stamp set onto Lemon Lime Twist cardstock, with Dapper Denim ink. Use the 1″ Circle Punch to punch it out, then attach it in the middle of the medallion, with Stampin’ Dimensionals. Once you’ve attached the medallion to the card front, use Wink of Stella to add some glimmer to the edges of the medallion. The picture above shows the subtle glimmer of the Wink of Stella. I like this fun card with all it’s layers of Designer Series Paper, plus the layers to create the medallion! JOIN IN OUR FUN SKETCH CHALLENGE THIS WEEK! Check out the rest of the Design Team’s cards at the Paper Craft Crew challenge page, and grab the link! Once you’ve finished your card, link up to the challenge. I can’t wait to see what sets you use for this fun sketch. Ordering supplies to create your projects is easy! Click on either the product images below, or on my signature. You’ll go directly to my online store, which is open 24/7 for your convenience. Beautiful card, Deborah. It is still one of my favorite sets. Way to kick up those medallions Deb. You mentioned that you had been having a rough couple of weeks. Know that you are in my thoughts and prayers.